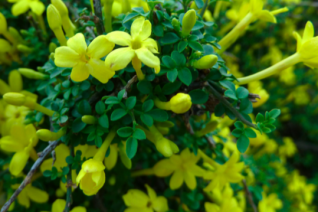 Winter Jasmine cheers us greatly when its shocking yellow (scentless) flowers erupt along the arching and climbing bare green stems of this shrub/vine in winter. Beginning in December it opens flowers continuously until a crescendo is reached in late February. To 9′ tall trained as vine. The lithe stems must be corralled and pegged or twiddled through a lattice. Be patient it will get there. Blooms occur on wood from the previous season. Prune directly after bloom has ended. Fast growing as a scandent ground cover. To 3′ tall x 8′ wide very quickly. Very nice trailing over banks, walls. This form has gold splashed leaves that appear in spring adding another dimension to this plant. Light summer water or none when established. Rich, well drained soil is ideal in full sun to part shade. Winter deciduous. Moderate deer resistance. One of the most wonderful cold hardy Jasmines. 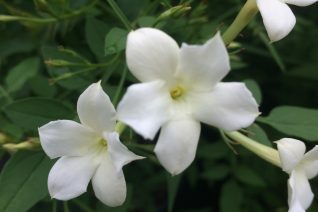 This form of Poet’s Jasmine has leaves boldly edged in ivory. The interior of the pinnate leaves are soft green. Vigorous twining vine to 15′ tall and as wide. In June a massive display of pink buds opens to powerfully fragrant sugar white flowers. Bloom continues through August. Very pretty multidimensional vine for a large pergola, fence, or very large trellis. The flowers are most fragrant in the evenings and morning. Very stable variegation- I’ve never seen it revert. Winter deciduous. Adaptable to full sun to dappled shade. Mix with other vines or send this vine climbing with a good rose. Light summer water in rich to average soil including clay soil. Regular summer water speeds growth and establishment in the first summer. MMMMMM. Smells so good. 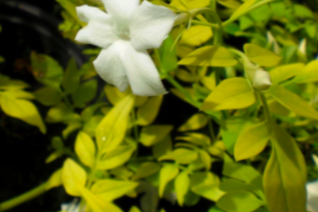 Vigorous, hardy twining vine that we love for its chartreuse foliage as well as profuse fragrant white flowers. Best in part shade- will take full shade with leaves a bit greener and less flowers. To 15′ tall and nearly as wide in 6 years. Rich soil to average soil- including clay soil. Takes quite a bit of summer drought when established. Blooms in clusters from June to August. Wonderful vine for contrast. Try it up a pergola with the light lavender blue flowers of a Clematis or an orange rose. Moderately deer resistant. Winter deciduous. 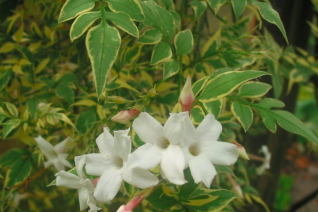 Adorable congested little shrubby Jasmine that is at home in rock gardens, shrub borders etc. To eventually close to 2′ tall it spreads slowly to 2′ wide in 7 years. 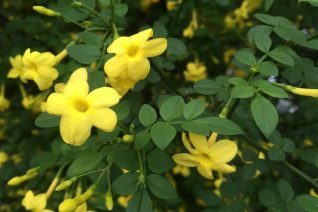 In spring and then sporadically all summer a huge display of soft yellow flowers with a sweet fragrance. Full, hot sun and rich to average well drained soil. Little or a lot of summer water. Easy, hardy long lived deciduous shrub. Never needs pruning. Moderate deer resistance. 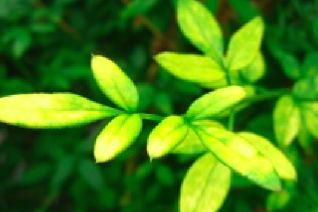 Amazing new color breakthrough for hardy Poet’s Jasmine. 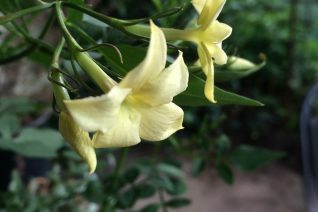 We love the clusters of pale moonlight yellow fragrant flowers that glow in clumps on this very vigorous deciduous vine. Fast growing to 15′ tall. Huge display of flowers in June followed by sporadic flowers until frost. The foliage has slight tints of gold as well. Deciduous and cold hardy to 0ºF. The soft flower color of this vine is exceptional. Very easy to grow. Powerfully fragrant flowers. A Xera Plants favorite. Twines, provide strong support. 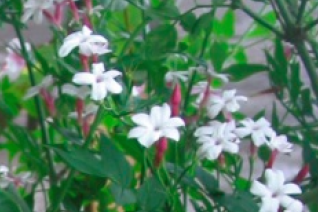 Vigorous form of Poets Jasmine thats distinct by having flowers that are entirely white and in larger clusters than the species. Fast growing twiner to 15’+ tall for a pergola or very very big trellis. Blooms June to frost. An initial large display in June. Medium green foliage is deciduous. In time the trunks become swollen and cork like. Powerfully fragrant flowers at night and in the morning. Moderate deer resistance. Cold hardy. Easy to grow vine. Vigorous and improved selection of cold hardy Poet’s Jasmine. with new growth that emerges maroon and profuse buds that are pink that open to highly fragrant 3/4″ white flowers. Huge floral display in June and then sporadically until frost on new growth. Deciduous vine that develops leaf tones of peach before the leaves drop. Huge vine that is suitable for a pergola or very large trellis. To 15’+ tall in 5 years. Rich to average well drained soil with light summer water which helps it re-bloom. Flower fragrance is most notable in the evening and morning. Very sweet. Mix with climbing roses. Prune AFTER flowering. Cold hardy. 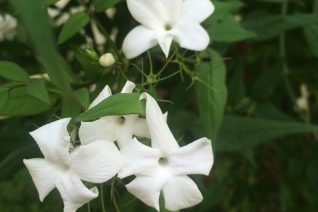 This form of Himalayan Jasmine we chose from seed after its incredibly fragrant yellow flowers drew our attention. Smaller leaves than the species and many, many more flowers in a huge display in late spring and sporadically until frost. Fast, large growing deciduous shrub that is incredibly tough and drought adapted. Takes any amount of pruning. May be trained as vine if you are diligent. To 9′ tall and 5′ wide quickly. Excellent plant for hedgerows and tough conditions out back. Black berries follow the flowers. Amazing form of Himalayan Jasmine with larger everything. 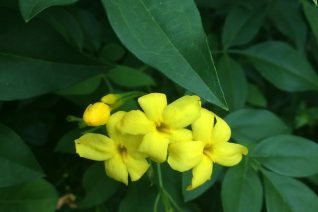 Larger leaves and clusters of larger yellow flowers with the fragrance of roses. Blooms heavily in late spring and sporadically into autumn. Fast growing to 10′ tall and 8′ wide in 10 years. It may also be trained as a vine and mixed on a trellis with blue Clematis for a wonderful combination. Train it as you would a climbing rose. Winter deciduous below about 20ºF otherwise evergreen/semi-evergreen. Full sun to part shade. Drought adapted when established. Little summer water. Moderate deer resistance. Fast and easy to grow.